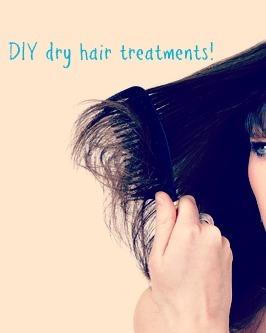 There are plenty of inexpensive options out there to help with dry/damaged hair. Many of the ingredients for these treatments are probably already in your refrigerator or pantry. Plus some of the chemicals they put in hair treatments these days are FAR from natural, and I have found dry my hair even more!! Try to do a treatment on your hair once a week, it is important to be consistent to really make a difference in the health of your hair. Mayonnaise Hair Treatment – Massage mayonnaise into the hair liberally and cover with a plastic bag. Allow the mayo to remain for at least 30 minutes. Shampoo, rinse and follow with a shampoo if necessary. Repeat this treatment for dry damaged hair on a weekly basis until the desired results are achieved. Banana Hair Treatment – Mash together one small, ripe banana, 1 tablespoon honey and 1 teaspoon sweet almond, olive, safflower or corn oil. Apply liberally to shampooed hair, cover with plastic and leave on for 15 to 30 minutes. Rinse thoroughly. Vinegar Rinse – Combine 1 drop essential oil with 1 teaspoon apple cider vinegar. Add a cup of boiling water and mix well, and then add this mixture to a bowl of water you’ll use as your final hair rinse. Rinse your hair thoroughly using this water, immersing as much of your hair as possible and pouring over the areas that are not immersed. Repeat every time you wash your hair for the best results. Use an essential oil that benefits dry hair such as sandalwood, lavender or rosemary. If necessary, you can omit the essential oil altogether and the treatment will still help nourish the hair. Olive Oil Treatment – Beat together 1 tablespoon olive oil, 1 tablespoon vegetable glycerin and 1 teaspoon apple cider vinegar. If you don’t have olive oil, you can use safflower oil, corn oil or wheat germ oil. To use, shampoo the hair as normal, apply the mixture evenly throughout the hair, wrap with plastic or a towel and allow to remain for 15 to 30 minutes. Rinse. Gelatin Deep Protein Treatment– Especially good for fragile hair, the gelatin in this dry hair treatment fortifies and strengthens. To make, combine 1 tablespoon plain gelatin with 1 cup purified water. Allow the mixture to gel slightly, but don’t let it set all the way. Add 1 teaspoon apple cider vinegar and if desired, 4 drops rosemary essential oil. Massage evenly into shampooed hair, leave on for 10 to 15 minutes, and then rinse. Repeat up to once per week, as necessary. Rosemary Oil Treatment – The rosemary in this treatment for dry hair repairs damage caused by wind, sun and water, and puts the luster back into your hair. The eggs and oil moisturize and condition. To make, combine 2 tablespoons avocado oil, 1 tablespoon castor oil, 2 teaspoons strong rosemary tea (Steep leaves in boiling water for at least 20 minutes), and 2 whole eggs in a small mixing bowl. Whisk until the mixture is smooth and creamy. To use, massage evenly through the hair, wrap with a towel and allow the treatment to remain for at least 20 minutes before shampooing and rinsing as usual.